The mother of all coloured revolutions was black and white. Its name: «Otpor», «Resistance». Its symbol: a white feast in front of a black ground, red colour was hated. «Otpor» was founded in the beginning of the 1990s in Belgrade. The group understood itself in sharp opposition to the rise of Slobodan Milosevic and his «Socialist Party of Serbia» (SPS). «Otpor’s» battle-cry: «gotov je!», «he is finished». «He» was the big enemy: Milosevic. The first manifestations against his government began in 1988. Their social character was evident. People protested against rising prices for living. These «bread-riots» pointed at the government, but meant the IMF that dictated what they called «reform», the abolishment of state subsidies for housing and goods of daily use. Out of parts of these protesters «Otpor» formed a political group with one single goal: to get rid of whom they called «the autocrat», Slobodan Milosevic. After the end of the Soviet Union and Yugoslavia the legitimacy of rule and governance was debated widely in a political and philosophical sense. Where rulers of the old type or their supposed revenants did not give way voluntarily, oppositional groups felt legitimated to overthrow the system. This also happened in Serbia. Slobodan Milosevic and his SPS undermined the shock therapy of the IMF in Winter 1990/91 by setting in motion the money-printing machine. The fresh banknotes allowed paying state employers like teachers, doctors and military. Hence he obstructed the restrictive monetary policy, prescribed by the IMF. What was appreciated by vast parts of the people, provoked Western organisations, and he became an enemy of them. «Otpor» repeated its standpoint: «Milosevic has to leave». 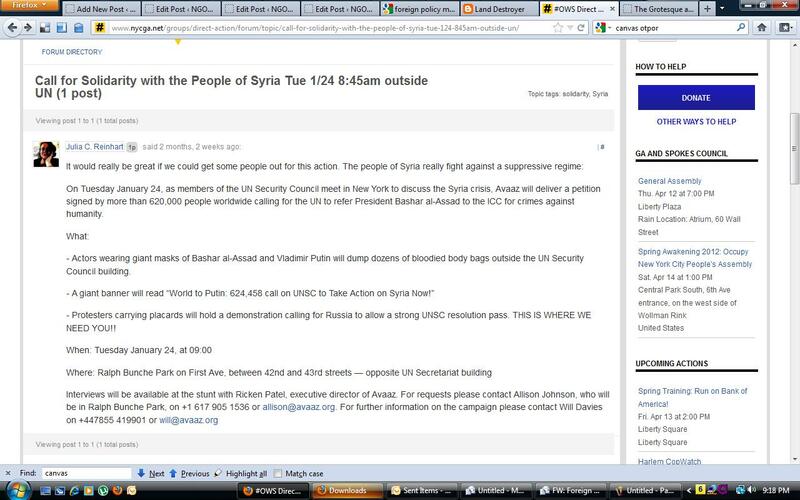 It took some time until the potential of this oppositional group was discovered by Western financiers. Since the middle of the 1990s masses of so-called Non-Governmental Organisations (NGOs) have been operating in the countries of ex-Comecon and Yugoslavia. Their «mission» followed slogans of «democracy», «nation-building» or «new governance». They aimed at interfering in politics by supporting local oppositional groups of civil society. One of the most prominent and strongest «Mission»-organisation to bring Western democracy to Eastern and Southern countries is the American foundation named «National Endowment for Democracy» (NED). Founded by the US-Congress in 1983 and financed by state-money since then, NED has the function to distribute an annual amount of a three-figure million Dollar number to four so-called NGOs: The «National Democratic Institute for International Affairs» (NDI), which stands under the influence of the Democratic Party, its Republican vis-à-vis, the «International Republican Institute» (IRI), the «Center for International Private Enterprise» (CIPE) and the «American Center for International Labor Solidarity» (ACILS), one representing the Chamber of commerce, the other the AFL/CIO-union. These four NGOs, all of them fully backed by state-money and therefore cheating with the «N» in their self-representation as «NGO», work in their respected fields on the ground in Eastern Europe, the Islamic world and elsewhere. The ideological background of foundations like NED, the United States Agency for International Development USAID, «Freedom-House» or its British variant «Westminster Foundation for Democracy» is rooted in a specific understanding of what they call «universal democracy», which they claim to be spread all over the world. The concept is based on the declared necessity of economic competition and its political administration through democratic institutions. Democratic institutions have to follow the principles of market economy and not vice versa. The ideal, universalistic form of this model of democracy can be described as «constitutive liberalism» in a parliamentary two-party-system under a strong presidency. The electoral freedom excludes the social and economic system and reduces socio-economic debates, if admitted at all, to measures of tax policy. This understanding of democracy is not compatible with revolutionary processes having taken place in Eastern Europe and North Africa. There the vision of democracy reaches beyond the system of «constitutive liberalism» and its defence of property. On the contrary: revolutions overwhelm such things like property laws and open new radical perspectives. Political and media observers are well aware of this fact and its potential danger. Therefore all missions of civil society-interventions by Western foundations are united by one goal: to direct revolutionary processes in East and South towards the Western understanding of liberal democracy; to pave the way for «constitutional liberalism». Many democratic elections, for example in Eastern Europe, but also in the Arab world after 1989/91, did not reflect the Western idea of liberal democracy. The outcome were «false results» in the cases of Yugoslavia, Romania, and Slovakia, when leaders like Milosevic, Iliescu, Meciar or Fico received majorities at the ballot-box. The American political scientist and redactor in chief of the influential magazine «Foreign Affairs», Fareed Zakaria, named these democratic elections, when Milosevic or Meciar took legal power, «illiberal democracies». (1) In his view it is not the democracy as such that are in ill health condition, but the constitutional liberalism. He even makes his view more concrete: «Democracy without constitutional liberalism is not simply inadequate, but dangerous». Meciar, Iliescu, Milosevic, Yanukovych… they all won elections and got majorities, some of them more than one time. Nevertheless Western media and politicians call them despots, autocrats, nationalists, communists or national communists. Western foundations like NED, USAID, Westminster or Freedom House see their task in spreading their universalistic claim of a bourgeois, liberally constituted democracy throughout the world. In the societies of transformation they intervene into civil society by moulding local protests into coloured revolution. How do these interventions function? At the beginning local or national discontent, which almost always is rooted in social problems, has to be «politicised». That means that social revolutionary elements have to be excluded. They could be dangerous for the establishment of a liberal democracy. In a second step cadres are formed. They run through different seminars in «regime change», «liberal democracy», «institution building», «nation building» etc. Allen Weinstein, one of the founders of NED, once stated openly, what the function of organisations like NED was like at the beginning of the 1990s: «A lot of what we [NED] do was done 25 years ago covertly by the CIA». (2) In some cases like in the case of James Woosley this statement can be proved even biographically. Woosley was head of the CIA between 1993 and 1995, before he led the board of «Freedom House». If the civil society interventions do not fulfil the aim of «regime change», a military intervention can take place, like it did in Yugoslavia in March 1999. Since the rule of Bill Clinton civil mission and military threat go hand in hand. Barack Obama brings this system to perfection. With the help of Western foundations, the Serbian «Otpor» positioned itself as a more or less successful export model. From Georgia to Ukraine, Belarus and Egypt former activists of «Otpor» hold trainings and seminars in civil resistance to form NGO-units of oppositional groups to overthrow the respective political leaders and governments like Shevardandze, Kuchma/Yanukovych or Lukashenko. Not everywhere the plan is functioning, like the case of Belarus shows. There the local coloured revolutionaries were persecuted and moved to Lithuania or Poland, where they now maintain their infrastructure like radio stations, offices and «universities». In July 2012 the Russian Duma passed a law which obliges civil society organisations to financing transparency. This includes the declaration and control of foreign money. The Western resentment at this law is dishonest in some regards. On the one hand, the civil society interventions of Western foundations for Eastern and Southern coloured revolutions get more and more visible. Their function is evident. Even more: For example NED is publishing openly which NGO is getting how much grants. In its annual statement of accounting (2011) NED notes that it concentrated on subsidising NGOs in Belarus, where organisations like «Freedom of information» (1,23 Mio Dollars) or «Civil Society» (300.000 Dollars) all together received 3,5 Mio. Dollars in 2011. On the other hand, Russia is not the first country to hinder civil society interventions from outside. So Venezuela closed down the NED-bureau in Caracas in December 2010. And Egypt checked the bureaus of five foreign foundations and brought more than 40 responsible employees (Americans, Germans, Serbians and Egyptians) to the court. They are accused of «illegal activities with illegal money transfers». The annual joint South Korean and U.S. exercises dubbed “Key Resolve” last month for the first time practiced deploying more than 100,000 South Korean troops in North Korea to stabilize the country in case of regime collapse. This year’s exercise supposed that civil war breaks out due to conflict between hawks and doves in the North Korean military. It envisioned deploying several South Korean Army corps south of Pyongyang to bring hardliners under control and stabilize the North. A few years back, the two countries’ militaries formulated a contingency plan for six scenarios of sudden change in the North — a coup, civil war, a mass exodus of North Koreans, a massive natural disaster, and kidnapping of South Korean citizens by the North. But they did not stage a drill on the specific assumption of civil war for fear of upsetting the North. “We conducted the drill this time because top military leaders in South Korea and the U.S. concluded that nobody knows what scenario will materialize because the regime of new leader Kim Jong-un is still unstable,” the source added. Seoul is reportedly worried that North Korean military hardliners have strengthened their position since former leader Kim Jong-il’s sudden death late last year. 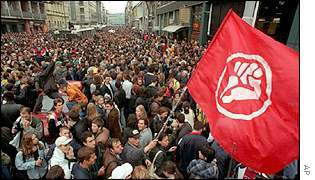 Image on far left: In 1998 the Otpor logo appears in Belgrade. 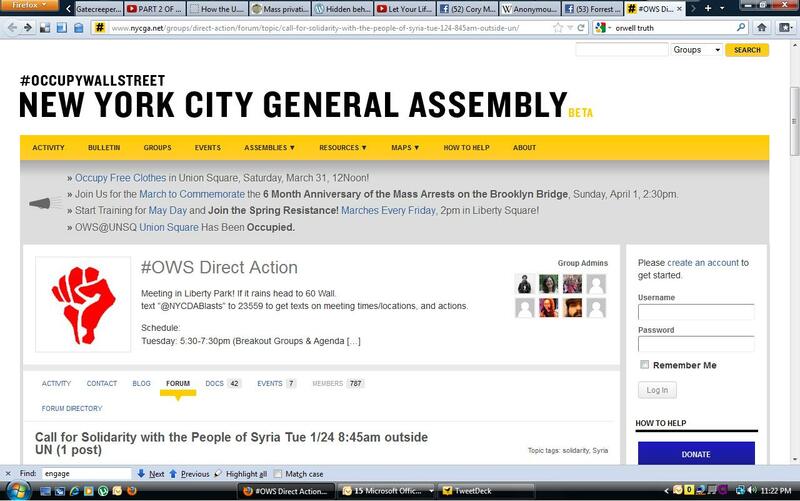 Image on left: Otpor logo as found on the New York Occupy Wall Street Official website (2012), featured above an Avaaz destabilization campaign against Syria. (screenshot below). Read more about Avaaz here. February 19, 2012, by Tony Cartalucci. The following is an excerpt. The full article can be read here. Shortly afterward, April 6 would travel to Serbia to train under US-funded CANVAS, formally the US-funded NGO “Otpor” who helped overthrow the government of Serbia in 2000. 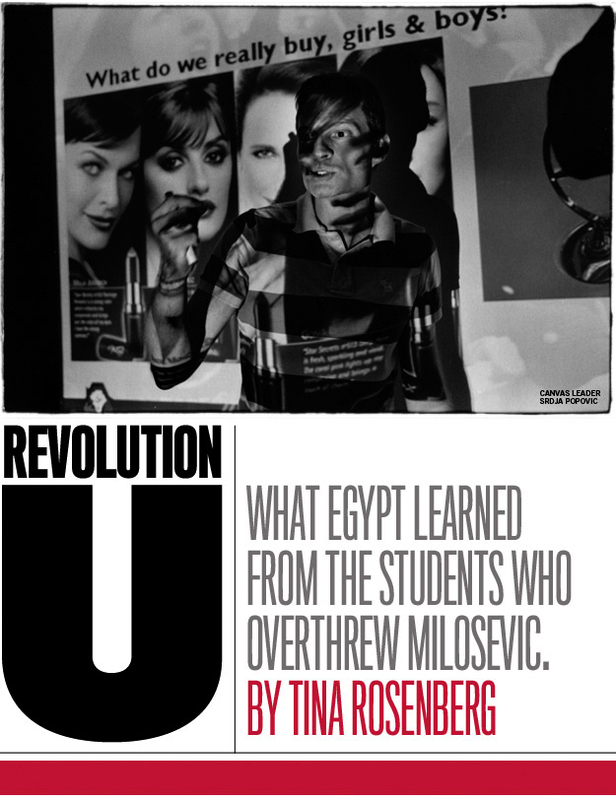 Otpor, the New York Times would report, was a “well-oiled movement backed by several million dollars from the United States.” After its success it would change its name to CANVAS and begin training activists to be used in other US-backed regime change operations. Due to the widespread interest in the Creative Activism Lecture Series this fall, and in order to better accommodate all guests, RSVP is required; please show up early. 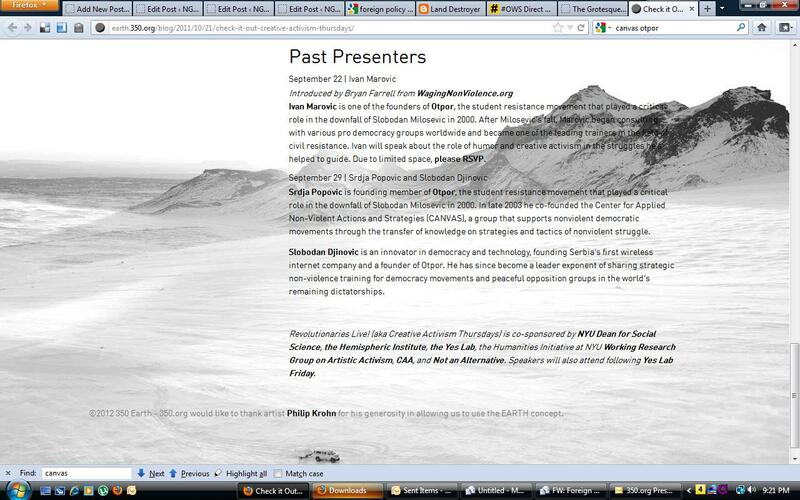 If you don’t RSVP, you can still show up and we’ll let you in 5 minutes before the lecture starts if there’s room. 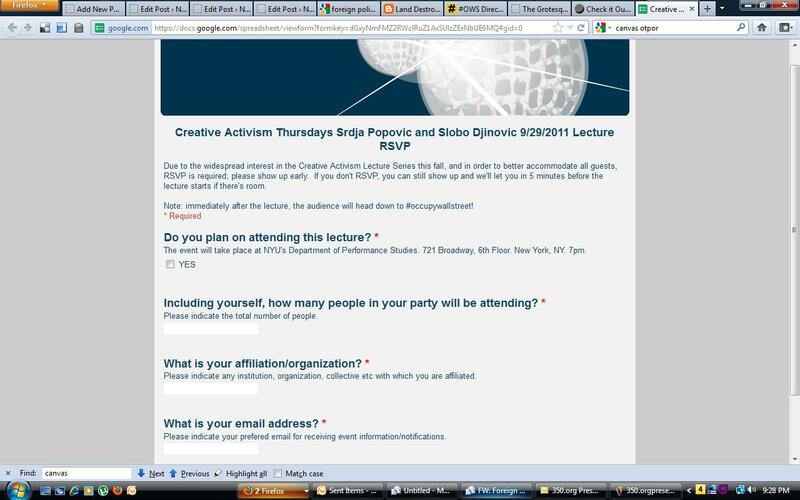 Note: immediately after the lecture, the audience will head down to #occupywallstreet!